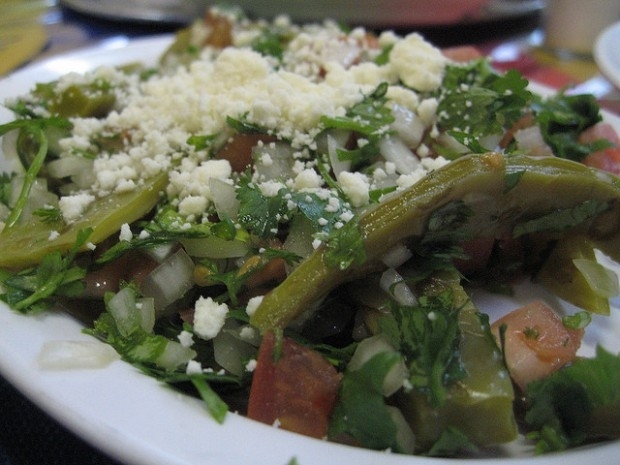 Nopales, which can add interest to any landscape and, when harvested, a green-bean flavor to many dishes, are easy to propagate and grow in most parts of California, says UC Cooperative Extension farm advisor Richard Molinar. Molinar has produced a sampling of spineless and spined varieties of the cactus plant at the UC Kearney Agricultural Research and Extension Center specialty crops demonstration field. Late winter, he said, is an ideal time to plan for planting nopales when the soil warms and the threat of freeze passes. Nopales may be started from seed, however, growth from seed is slow. Propagation from pads is simpler and faster. From a growing cactus - which can be purchased at nurseries or found in landscapes of friends or neighbors - cut a pad that is at least six months old and sit it upright while a callous forms. This takes a week or two in warm weather, longer when the air is moist. When planting the pad, settle it upright about an inch deep in a mixture of equal parts of soil and sand or rough pumice. Planting the pad too deeply will encourage rot. Anchor the pad in place with rocks to keep it upright. In areas with intense summer sun, situate the pad so that the slim side points north and south, and the broad side east and west to prevent sunburn. Do not irrigate. The moisture stored in the pad is sufficient for roots to sprout, and excess moisture may cause rot. After roots have formed (in about a month) irrigate, and allow the soil to dry completely between subsequent irrigations. Wait several months before beginning to harvest. The ease of nopal propagation was demonstrated in Molinar's field, where pads fell to the ground, took root and began growing entirely on their own. Feed nopales with a high-nitrogen fertilizer. In warm climates, well-tended plants may be harvested up to six times a year, and established plants may yield 20 to 40 one-half pound pads at each harvest. Remove the pads by carefully cutting them from their supporting pads. The best time of day to harvest the pads is from mid-morning to mid-afternoon, when the acid content is lowest. Spineless and spined varities of nopales at the Kearney Agricultural Research and Extension Center. A serious pest of nopales is cochineal scale. Molinar said that, at Kearney, cochnieal was responsible for the failure of several varieties of spineless cacti. The nopales with spines seemed to carry greater resistance to the pest. "Resistance isn't related to the spines themselves, but something in the genetic makeup," Molinar said. "It was fairly obvious. We did have one or two spineless varieties that weren’t attacked either." Over the centuries in Central America, cochineal scale was valued as a source of red dye. During the colonial period, cochineal scale was Mexico's second most valued export after silver, however, the development of synthetic pigments reduced demand. 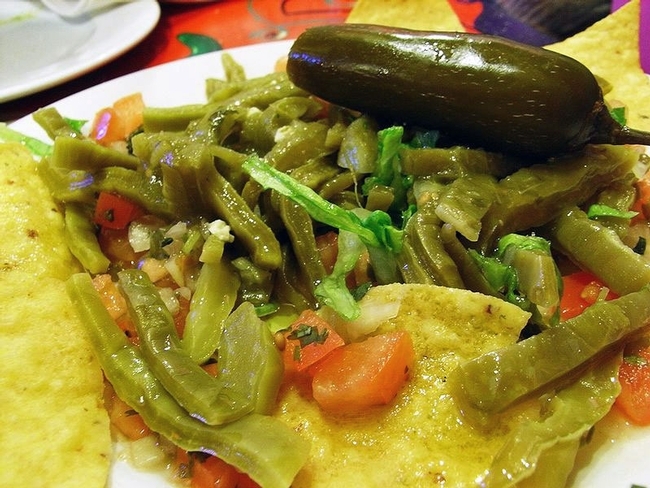 Nopales cooked with other vegetables and tortillas. Fresh pads are full of water and should be bright green and firm. Collected in the garden or purchased at ethnic grocery stores and farmers markets, the smallest, young pads are the most succulent, delicate in flavor and have the fewest spines. To prepare the pad, hold its base and scape both sides with a blunt knife to remove the spines. Peel the pads and cut them into shoestring strips or small cubes. They can be eaten raw in salads, boiled and fried like eggplant, pickled with spices, or cooked with shellfish, pork, chilies, tomatoes, eggs, coriander, garlic and onions. For more information, see the UC Small Farm Program's Family Farm Series article on Prickly Pear Cactus Production.